& The Invocation of Ra-Hoor-Khuit in the manner of the Buddhist Mahayoga Tantras. I must quote (or paraphrase) Jason Miller. He is known to say that just as European culture has spent the last 1,000 years developing, say, orchestral and symphonic music, so the cultures of Tibet and India have spent that time developing method and instruction for spiritual practices. Indic magico-religious practice (whether Hindu or Buddhist) has a level of clarity, of detailed vocabulary to describe precise states, of tricks and work-arounds to help ritualists get the results that they seek. By applying those to western deity forms we can recover a great deal of what was lost in the west with the end of theurgy and Pagan religion. Sam Webster is an old co-conspirator in occult and Pagan organizing and philosophy, and I’m very pleased to say that he has done a fine job of presenting a very useful spiritual technology. Tantric Thelema is an application of Vajrayana Buddhist esoteric methods to the myth and symbol of Aleister Crowley’s magical religion of Thelema. By doing so he offers western magicians and theurgists the best step-by-step guide to the invocation of the presence of a deity I can remember seeing in print. The small book is arranged as a manual, in the form of a teaching. It is delivered in the author’s voice speaking to his beloved wife, Tara, who was lost to illness some years ago. The gentle, reverent voice thus produced gives the whole teaching an easy, pleasant feel. The manual is utterly practical. With only a few pages of introduction it moves immediately into the first section of the detailed spiritual practice (sadhana) that it teaches. In this section we find the most overt orthodox Buddhism. Classical Buddhist ideas such as ‘taking refuge and dedicating merit’ are taught in a fairly straight-forward Vajrayana way, using symbols and verses from the Book of the Law. The author does a fine job of reconciling Buddhist ideas with Pagan ones. Some are very nicely suited to Druidic work, such as the invocation of the Lineage of Teachers. While I hesitate to fiddle with a well-made device, these preliminary exercises could be replaced with whatever preliminaries one’s own system preferred, without harming the later techniques. The meat of the teaching concerns what is called Deity Yoga. Combining incantation with visualization and offerings it will all feel quite familiar to experienced invokers. What is less familiar is to see the method laid out in such clear, step-by-step detail. Two forms of invocation are described. “Generation In Front” invokes the deity as though into an image before you, to receive worship in an I-Thou formula. “Arising As” formulates the deity in the person of the invoker, allowing the invoker to act as the deity in some ways, for instance in granting initiations and empowerments. It is through the latter formula that further Thelemic Tantra becomes possible, as a couple arises together as god and goddess. Yr Hmbl writer knows very little about Vajrayana, but I was never at sea with Webster’s descriptions of ideas or methods. I know rather more about Thelema, and it is a pleasure to see it expounded so gracefully, and without gothery. I know, I think, rather a lot about the mechanics of invocation, and I still learned quite a bit from this small tantra. 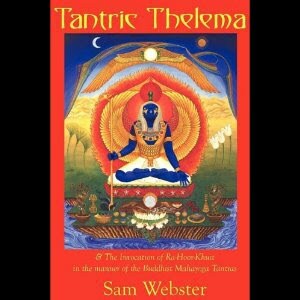 Anyone interested in restoring the juice to western theurgy could benefit from Tantric Thelema. Great review, the book sounds intriguing! Funny enough the quote that you grabbed from me, I grabbed from Sam Webster!